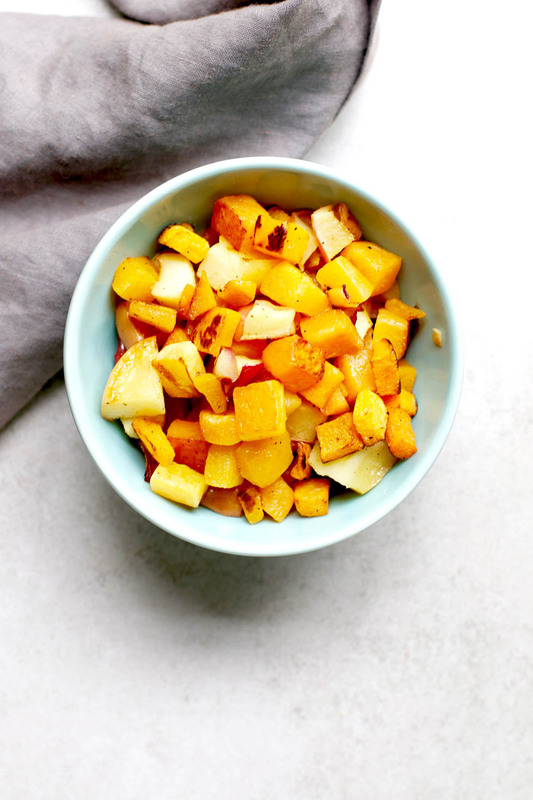 Packed with Vitamin A and fiber, this easy roasted butternut squash and apple recipe is a simple, slightly sweet side dish that the entire family will love! 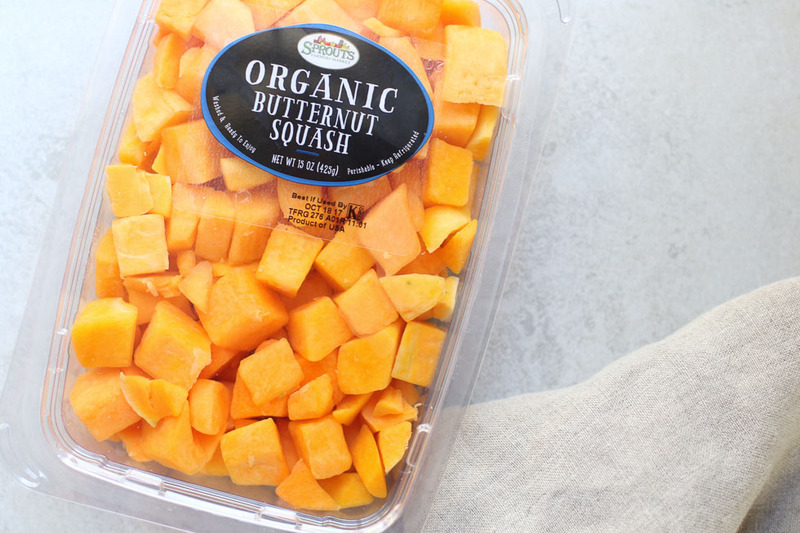 I’m in love with butternut squash but not the time required to slice and chop it. On busy weeknights, I’ve been known to take a shortcut with frozen or pre-cut vegetables. 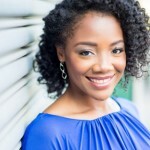 No shame in my game! They provide similar nutrition and health benefits and help make meal prep a breeze. This pre-cut butternut squash works great in this easy roasted butternut squash and apple recipe but can also be used to make soups, other side dishes, and salad toppers. 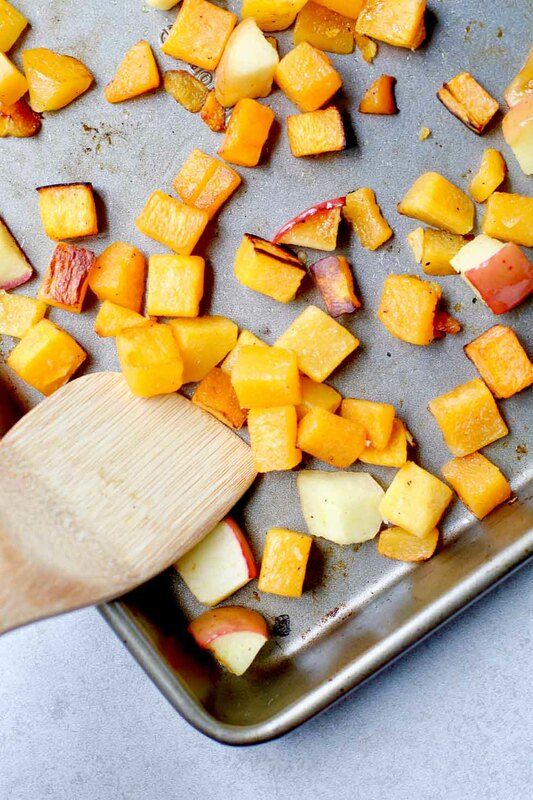 Spread the squash and apples onto the pan, leaving plenty of room for the chunks to roast. This is maybe the most important step. If you crowd the pan or add too much oil, the squash and apples will steam and not get the nice browning that gives so much flavor. Use a large sheet pan or cook the squash and apples in batches. About halfway through roasting, turn the butternut squash and apples to get maximum caramelization on all sides. And there you have it! 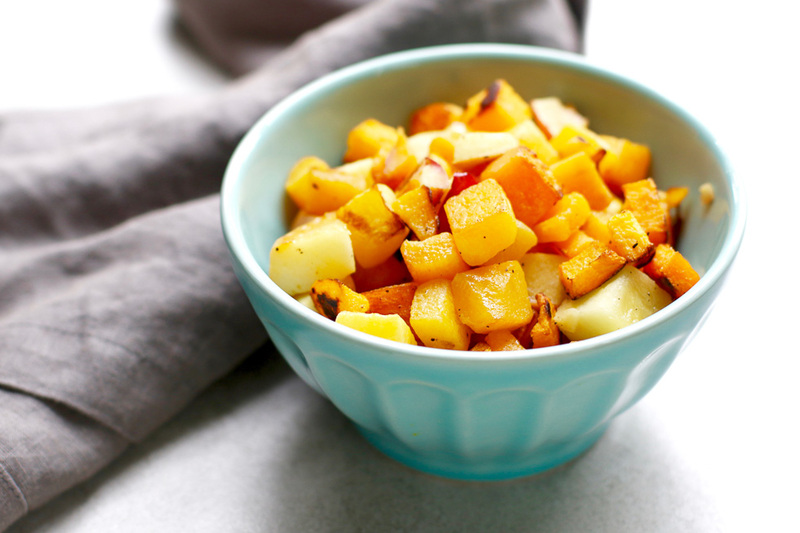 This easy roasted butternut squash and apple side dish almost makes itself! It’s perfect served warm or even at room temperature. Add a drizzle of warm honey or a sprinkle of chopped rosemary, thyme, or a little sage for a pop of color and earthy, herb flavor. Go ahead and PIN it now and scroll down to the recipe to see just how easy it is. 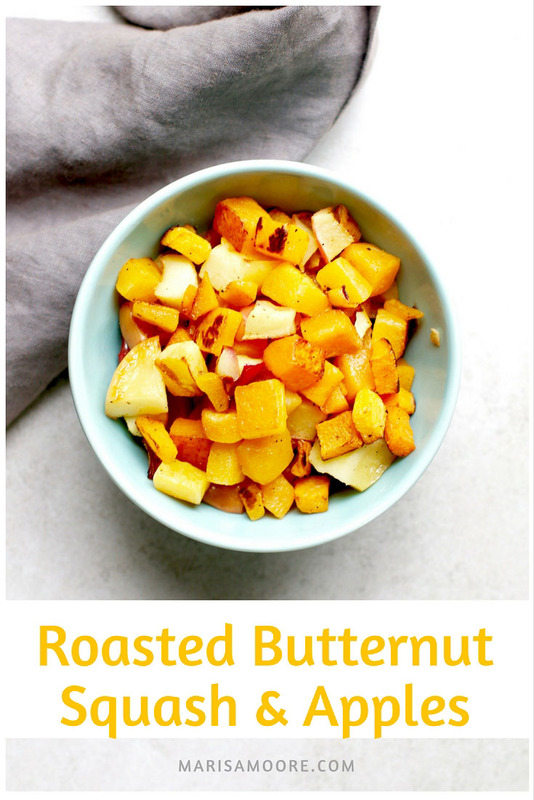 Packed with Vitamin A and fiber, this easy roasted butternut squash and apple recipe is a simple, slightly sweet side dish the entire family will love! 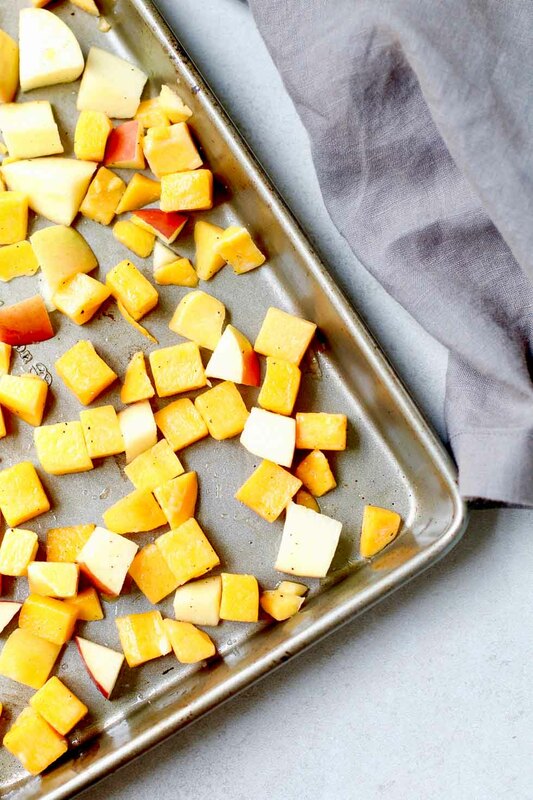 Spread the squash and cut apples onto a large sheet pan in a single layer. Drizzle with olive oil and sprinkle with salt and pepper. Toss to coat. Roast 20 minutes, turning once, until the squash and apples are caramelized. Remove from the pan and serve. TIP: Top with a drizzle of honey or fresh chopped thyme, rosemary or sage for extra flavor.